The Cincinnati Bengals, like all other NFL teams, have some question marks they need to answer this year. Unlike many other teams, answering those questions gives them a great shot to make the playoffs. In 2017, the Cincinnati Bengals lost four games by one possession. Their record was 7-9, and last year’s wild-card teams (the Buffalo Bills and Tennessee Titans) make it in with 9-7 records. A touchdown here or there and the team is back in the postseason. Here are our calls for the four biggest issues the team must address to go playoff-ing. Will the offensive line improve enough? We’ve been beating this drum more than Andrew Neiman in the movie Whiplash. Many times over the last few years, the Bengals’ O-Line performances has left their fans sounding like … well, Terence Fletcher in the movie Whiplash (Editor’s Note: Look it up on YouTube, but NSFW). We talked a few weeks ago about the team’s recent offensive struggles. Frank Pollack taking over as line coach is definitely a breath of fresh air. Acquiring Cordy Glenn and losing Russell Bodine are steps in the right direction. And each year, the Bengals have drafted or traded for more move-the-ball talent, so you’d think that would provide extra motivation for the big uglies. It’s not like their efforts at improvement would be in vain. As soon as the line gets going, so will the fireworks. This is the year for that to happen … right? Will John Ross and Tyler Eifert stay healthy? These two have been bitten (well, chomped) by the health bug the last couple of years. The last time Eifert played close to a full year was 2015. That season, in 13 games, he caught 52 passes for 615 yards and 13 TDs. Ross is only in his second year, but his NFL-Combine-record 4.22 speed should keep DBs playing catch-up. Since they both represent different elements of the passing game, having them healthy and on the field gives the defense a lot more ground to cover. It also means those defenses can’t focus on shutting down the running game – which isn’t running on full batteries to begin with. Who’s after Dalton if he gets hurt? While we’re on the topic of health, let’s address Andy Dalton’s. If he’s injured, the Cincinnati Bengals will be turning to journeyman Matt Barkley, Jeff Driskel (who spent last year on injured reserve), or rookie Logan Woodside. For his career, Barkley has completed almost 60% of his passes, but holds a TD-to-INT ratio of 8-18. Driskel and Woodside have as many pro passing attempts as noted German physicist Hermann Ludwig Ferdinand von Helmholtz (1821-1894). Hopefully, the offensive line can keep Dalton vertical. Will the Bengals D generate more turnovers? Cincinnati only had 14 takeaways last year, including a measly 3 fumble recoveries. New DC Teryl Austin should change that. Last year with the Detroit Lions, his defensive squads tied for fourth in the NFL in interceptions (19) and forced fumbles (19). Here we are, Cincinnati Bengals fans – Christmas Eve! Our old friends the Baltimore Ravens come to town for a high-noon kickoff tomorrow. We must say, it looks like a match-up that’s in Cincinnati’s favor. A win would be big because it gives us huge momentum, as well as the upper hand over a division rival right off the bat. Also, we don’t necessarily love the fact that Baltimore isn’t at full strength, but ……. well, actually, yes we do. Let’s break down what we believe are the three keys to a Bengals’ win. Go after Joe. Joe Flacco will start, but he has been hurt and missed all of training camp and the preseason. Add to that the fact that he’s about as successful in Paul Brown Stadium (2-6 in the last 8 games, 5 TDs, 12 picks) as Dr. Evil is in taking over the world. It’s a situation that should make the Cincinnati pass rushers (remember, we’ve got Chris Smith and Jordan Willis now) giddy. Put some pressure on him, maybe a hit or two or 15, and their passing attack will crumble. Solid line play. Anyone who has read our blog more than once knows the O-line has been the team’s most concerning area. Baltimore is a good opponent to start with for us, since they only tallied 31 sacks last season. It’ll be a great confidence boost to our big uglies if they can keep Dalton upright. Plus, if we can establish a big-enough lead, they can practice some run blocking to use up clock late in the game. So get ready, Cincinnati Bengals fans. We’ve waited a long time. And it’s about time we get back to the postseason. The first step is tomorrow. Organized team activities have begun around the National Football League. They are the first real steps we see of our 2017 teams taking shape. Coaches start to gauge position groups. Rookies, hopefully, make good first impressions. Bloggers will come at you with their take on who will have a big year based on that one-handed catch they made yesterday. And, of course, we discuss the depth chart. In fact, that’s one of the reasons were so excited about the Cincinnati Bengals this season. A few of the right players in the two-deep can be the key toward improving last year’s 6-9-1 season. That could easily mean playoffs, baby! Let’s look at each offensive position group for the Cincinnati Bengals for 2017. Quarterback: Starter – Andy Dalton. Backups – AJ McCarron, Jeff Driskel. Dalton is the clear-cut starter if he can stay injury-free. If he goes down, we think McCarron can do a serviceable job. Running back: Starter – Jeremy Hill. Backups – Giovani Bernard, Joe Mixon, Cedric Peerman, Tra Carson, Jarveon Williams, Stanley Williams. Hill and Bernard are capable, and the newly drafted Mixon adds power and speed. Fullback: Starter – Darrin Laufasa. He has a great FB frame at 6’1 and 250 pounds. He also blocked for running back Aaron Jones, who rushed for 1,773 yards at UTEP last fall, so Cincy is in good hands here we think if they decide to keep a true fullback. Wide receiver 1: Starter – AJ Green. Backups – Cody Core, Josh Malone, Jake Kumerow, Alonzo Russell. Green returns from injury and, we think, will have a typically big year. It didn’t take long for the team to sign Josh Malone, so he’ll be able to start learning the offense and adjusting to the speed of the pro game. Wide receiver 2: Starter – Brandon LaFell. 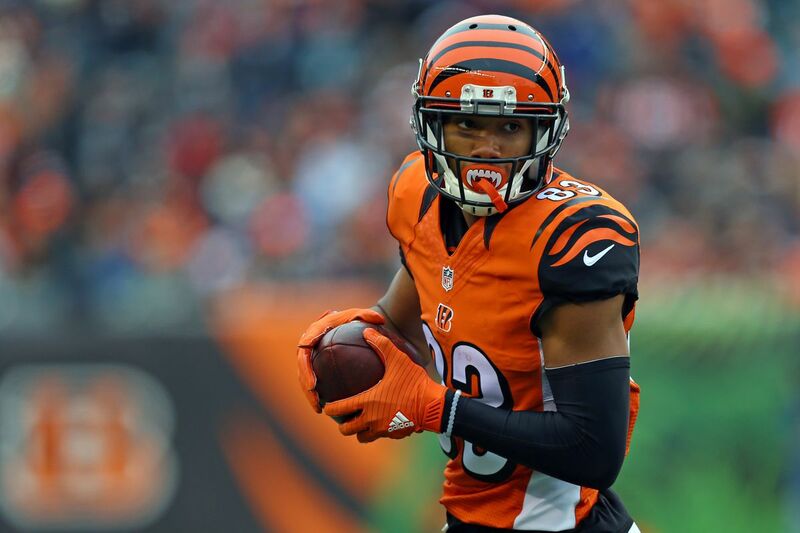 Backups – Tyler Boyd, Chris Brown, Monty Madaris. LaFell had 64 catches and six TDs last year. Boyd went over 600 yards receiving. The WR2 spot looks solid. Slot receiver : Starter – John Ross. Backups – Tyler Boyd, Alex Erickson, Karel Hamilton. With the addition of Ross, this position could see a big boost, which opens up the offense. We put Boyd here as well as we think he will get chances in the slot as well. Tight end/H-back: Starter – Tyler Eifert. Backups – Tyler Kroft, Ryan Hewitt, C.J. Uzomah, Mason Schreck, Cethan Carter. Hopefully, Eifert can stay healthy this year. Kroft was only targeted 12 times last season, but made 10 catches, throw in Uzomah who shined at times last season and Hewitt who has shown he is capable and the Bengals should be fine at this position. Center: Starter – Russell Bodine. Backups – TJ Johnson, JJ Dielman. Bodine, a fourth-year player out of North Carolina, is getting better every year. Left guard: Starter – Clint Boling. Backups – Trey Hopkins, Dustin Stanton. Boling played 73 straight games from 2012-2016 and had a separated shoulder for much of last season, and gutted it out. Toughness, much? Right guard: Starter – Andre Smith. Backups – Christian Westerman, Alex Redmond, Kent Perkins. It’s a tall order to replace Kevin Zeitler. Hopefully, Christian Westerman will bring his A-game in 2017 and Andre Smith might start here if Westerman doesn’t outshine him. Left tackle: Starter – Cedric Ogbuehi. Backups – Andre Smith. Let’s pray Ogbuehi improves.